To make Crust: Stir together flour and salt in large bowl. Dissolve baking soda in buttermilk. Beat sugar and butter in mixing bowl with electric mixer until fluffy. Beat in buttermilk mixture and vanilla. Add flour mixture, and beat until soft dough forms. Shape 1/3 of dough into disk, and seal in plastic wrap. Shape rest of dough into larger disk, and wrap. Chill 1 hour or overnight. To make Filling: Combine cranberries, sugar, lemon rind and 1/2 cup water in saucepan over medium heat. Bring to a boil, and cook 10 minutes, or until thick and syrupy. Stir in pears, and cool. Preheat oven to 350 degrees F. Flour rolling pin and work surface well. Take out large dough disk, roll into 12-inch circle and transfer to 9 1/2-inch fluted tart pan with removable bottom. Gently press dough into pan, letting excess flop over rim. Spoon filling into crust. Roll small dough disk into 10-inch circle, and cut into 1/2-inch-wide strips. Lay half of strips 1 inch apart over filling. Place remaining strips 1 inch apart on diagonal to form lattice. 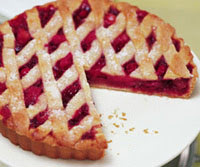 Seal lattice to crust by pressing rolling pin around rim of pan, so pan edge cuts through dough. Remove excess. Bake 55 to 60 minutes, or until golden and bubbly. Cool 20 minutes on wire rack. Remove from pan, and cool fully on wire rack. This entry was posted on 1:55 AM and is filed under Desserts . You can follow any responses to this entry through the RSS 2.0 feed. You can leave a response, or trackback from your own site.